Commonly swimming along the reefs but feeds in mid-water depths. 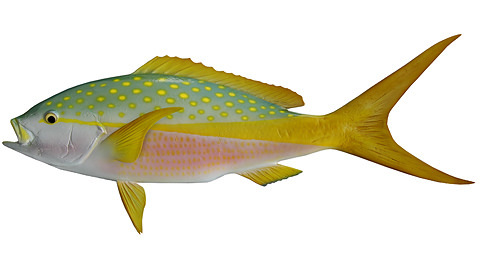 Although abundant, anglers find the Yellowtail a wary eater and a master of de-hooking itself. The coloration is characterized by a prominent lateral yellow stripe originating on the snout, widening, and covering the caudal fin. The back and upper sides are olive to bluish with yellow irregular spots. The belly and lower sides have narrow longitudinal stripes that are pale red to yellow, and the fins are yellowish. The yellowtail snapper is found from North Carolina to southeastern Brazil, but most abundant in the Bahamas, off south Florida and in the Caribbean. It seems to have the same role in the tropical reef fish community, that the vermilion snapper has with reef fish assemblages in the more northerly latitudes. Both species form schools and are found above the bottom over hard substrates in waters 60-300 ft. deep. Spawning takes place from April through August. Most females are sexually mature by age 3, and have passed 9 inches. The shape of the body and tail and size of the mouth and eye suggest that yellowtail snappers feed differently from most lutjanids. The majority of animals making up the diet are found on the bottom. Most western Atlantic snappers feed predominantly on benthic fish and large invertebrates. Most anglers pursue yellowtail snapper during the warmer months, but they can be caught throughout the year.